Execution Grasp the parallel bars in a narrow grip with your hands in the neutral position, keeping your torso straight and your knees bent.Breathe in and lower yourself without bending your torso forward to avoid using the chest muscles. You should feel like you are “straightening” your arms rather than pushing. To achieve this, make sure that your elbows do not move too far from your torso. Push back up again when you reach the lowest point of the movement and breathe out at the top . 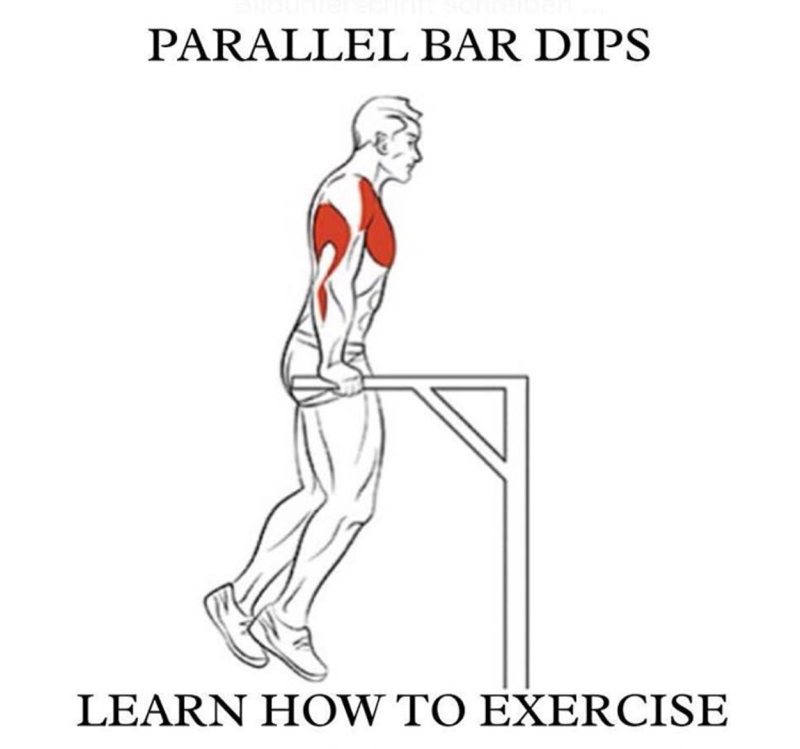 Comments Like the Bar Dip for the chest, this is an excellent exercise for the triceps. Despite the involvement of the chest muscles and deltoid, you should try not to flex your shoulders (as in the Lying French Press) in order to concentrate the effort in the triceps and give all three heads a good workout . You will need to be careful if you have had any injury like “tennis elbow” or shoulder problems. This exercise should be done slowly unless you are training for a specific activity, and you should slow down and/or increase the number of repetitions you do rather than adding weight . the chest muscles, using too much weight (if applicable), poor torso position during the movement, and doing the exercise too fast . Related article: How Long Should I Wait Between Sets? How Many Reps Should I Do?